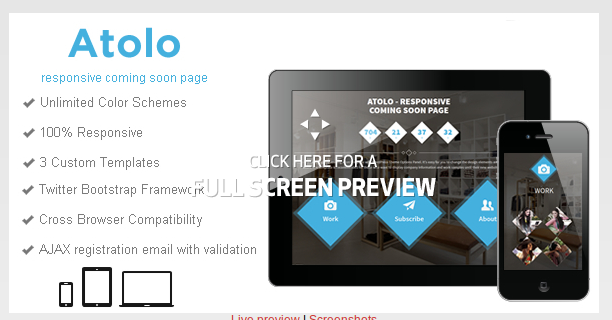 Atolo is a simple and easy to use coming soon template with 3 variations. It’s based on Twitter Bootstrap framework. It’s easy for you to change the design elements and colors with less effort. 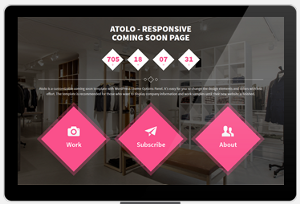 The template is recommended for those who want to display company information and work samples until their new website is finished. It has a responsive design so it’ll be displayed perfectly on all kind of devices (desktop, tablet, smartphone). Get this amazing coming soon template for FREE! Ready to grab this responsive template absolutely for free today? You will be redirected to the Information page. Fill the necessary info and submit.